ISLAMABAD, Pakistan (Thomson Reuters Foundation) – Pakistani growers are turning to organic farming as a way to adapt to climate change, boost food security for their families and increase their income. 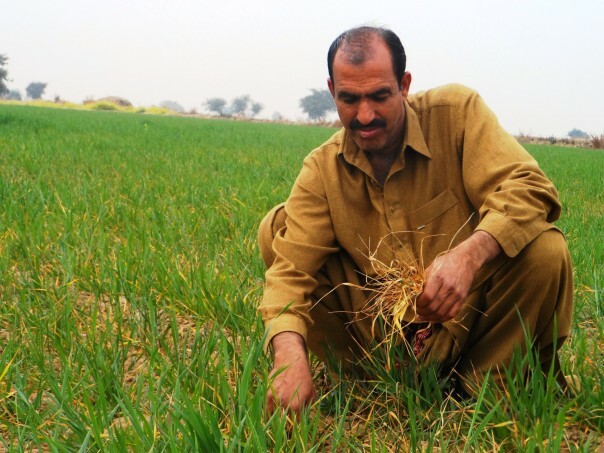 Durez Khan, 45, a farmer in the Chakwal district of Pakistan’s Punjab province, has been cultivating organic wheat for the last eight years to cope with erratic weather, including lengthy dry spells, and to save money on fertilisers and pesticides. “Organic farming ensures food security for my family besides getting a good rate for the spare wheat in the local market,” Khan, who owns about 10 acres of land, told Thomson Reuters Foundation in an interview. Indigenous seed used in organic farming “is more resilient to erratic weather than the hybrid seeds available in the local market,” he said. At least 70 percent of Pakistan’s land is arid, with rainfall insufficient in some areas to grow crops without irrigation. The increasingly erratic rainfall is pushing a growing share of small farmers to organic farming as it requires a smaller cash investment and is producing good yields, farmers said. “If we have abundant and timely rainfall, the organic crops give around a 10 percent higher yield,” he said, adding that growing crops organically also helps increase soil fertility. The Pakistan Agricultural Research Council, a government organisation, is providing expertise, bio-fertilisers and seed to Pakistan’s growing number of organic farmers. The organisation is especially focusing on small farmers in arid areas totally dependent on rain to produce crops. Muhammad Farooq, a director at the National Institute of Organic Agriculture, said that many people believe introducing organic farming can cut yields, but in fact the opposite is proving true. “Our research shows that organic farmers get better yields from their crops; therefore the area under organic agriculture is fast increasing,” he said. In 2005, the total area under organic agriculture in Pakistan was 35,000 acres, which increased to 150,000 acres by 2010, he said. Today around 33 percent of farmers in Pakistan are doing some organic farming, he said. Small land holders in the country cannot afford heavy doses of fertilisers and pesticides, so training them about organic farming just makes sense, he said. Farooq said he believes increasing the amount of land being farmed organically in arid areas would increase production of crops like wheat and maize and boost farmer incomes. Organic farming has also boosted exports of organic cotton, dried and fresh fruit, rice and vegetables, he said, with those sales now standing at $100 million a year. “Pakistan is self-sufficient in food production and can also earn foreign exchange by exporting organic products to international markets,” he said. Nasar Hayat, an assistant U.N. Food and Agriculture Organisation representative in Pakistan, told Thomson Reuters Foundation that his organisation supports organic farming and organic food globally as healthy, nutritious and helpful to subsistence farmers. “If the Pakistani government supports organic farming and small farmers by offering some incentives, it will help boost food security,” he said. Organic farming could also help the country survive worsening impacts of climate change, he said, as it uses indigenous seeds that are more adaptable to the local environment. “The indigenous seeds usually require less water to grow and prove to be resilient to severe weather conditions and diseases as compared to hybrid seeds,” he said. He said organic farming in some cases may produce slightly lower yields but farmers still earn more as they do not pay for costly chemical fertilisers and pesticides. According to a 2013 World Bank report, more than 60 percent of Pakistan’s population survives on less than two dollars a day, the international poverty line. Critics of organic farming, however, say that it will not be able to produce sufficient harvests to meet growing demand in a world already facing food security challenges. via Faced with erratic weather, Pakistan farmers go organic.